← Today’s Workout: Stretch, Cardio & Booty! Today I woke up to sunshine and cool temps so I grabbed my sneakers and headed for the fitness trail. It’s been a while since I’ve been there so I set my Run Keeper app for a walk instead of a run and hit the pavement. I planned on going my normal route which is normally just shy of 5 miles round trip. As I reached the rec center, which is where I do the bulk of my run/walks, I was feeling good and decided to start jogging. It felt great to do it and I fell into pace rather easily. Once I hit the back entrance to the actual fitness trail I was surprised to see new posts with directional arrows had been installed. The trail really needed those as certain spots can get a little tricky. As I went further into the wooded section of the trail, I had to drop down to a walk again. I was getting a little tired and there were a lot of workers cutting the overgrown brush back from the path. Once I reached my halfway mark (which is the real trail start point) I noticed something interesting… a new sign that said START as well as 5K on it. 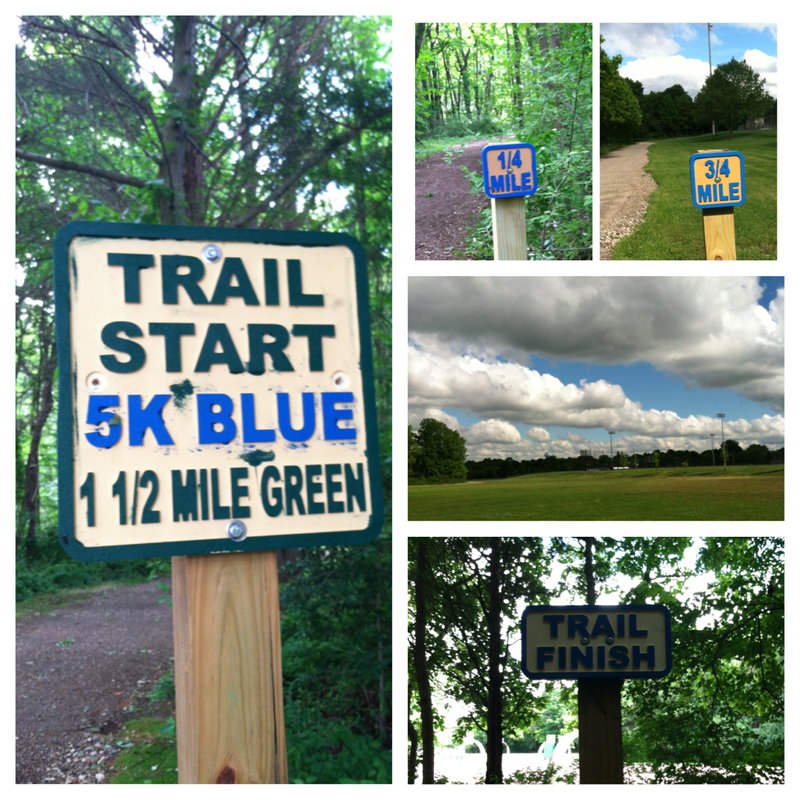 The trail was a never a 5K before and then I recalled seeing a new “path” on my way in. Of course I had to go check things out and I’m glad I did! The new trail is really nice and the view today was stunning. As I headed back from the “Start” of the trail I noticed mile marker signs along the way, too. It was really nice to see that they were cleaning things up on the trail and that they made the improvement by extending it. When I finally finished my walk, I ended up doing a little over 6.5 miles and it felt great. I can’t wait to head back up there and conquer the new section of the trail again.